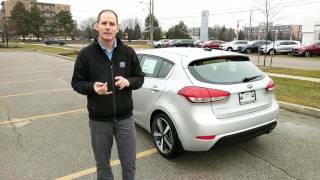 Kia recently shared the all new hatchback, Kia Forte5 2017. Company has given the model a new facelift and also integrated some better amenities and safety technologies to attract new buyers. Looking at the hatchback it feels like the company is preparing itself to bring a new design language for the entire lineup. Let us have a look at the review of Kia Forte5 2017 to know in detail about it. The interior details of Kia Forte5 2017 didn’t change much. Primarily company focused upon enhancing the spaciousness and a little work upon the layout. The sportive seats come wrapped in leather featuring contrast stitching while the door panels are dipped in orange. The interior is much about the safety features. The list includes blind-spot detection with lane-change assist and rear-cross traffic alerts. The seats come with heating features. Apart from these company also concentrated upon infotainment features and thus introduces Android Auto and Apple CarPlay. Not only this for the first time they introduced their own UVO eServices emergency and concierge service. This entire is served through the seven inch screen mounted over the center of the dash. Thus rounding up the interior details of Kia Forte5 2017 I would say, it has some really good features that will enhance your experience. 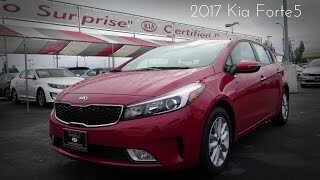 The exterior of Kia Forte5 2017 is where you’ll notice the major change. This is especially in the front fascia of the model where company replaced their traditional ‘tiger nose’ grille with the new ‘grin-like’ grille amidst the newly inculcated multi-element headlamps with LED daytime running lights. The front end is designed neatly and features premium looks. Moving towards the rear end, it has LED taillights while the lower section red trim accents and the dual-exhaust outlets. 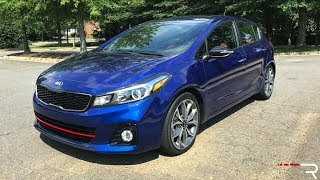 Thus rounding up the exterior details of Kia Forte5 2017 I would say, it looks elegant and mesmerizing rolling over those 18” wheels. Beneath the hood of Kia Forte5 2017 company brings two engine choices; first is 2.0 liter direct injection four-cylinder engine while the second one is a 1.6 liter four-cylinder engine. Both the engine will mate to six-speed manual as standard and has an option of six-speed automatic. 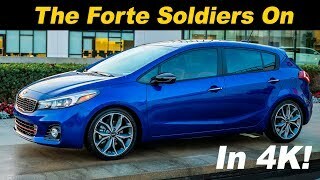 The performance figures of Kia Forte5 2017 are still not shared, however we assure you to bring them to you as soon as company unwraps the details.